Original Antique Maps and Prints. Description: This original antique map was published by Covens & Mortier ca. Artists and Engravers: The de L’Isle family was one of the most influential Geographers of the early 18th century in France. Claude de L’Isle, born 1644, had four sons, of which Guillaume was the most notable. Guillaume was born 1675 and became member of the “Academie Royale des Sciences” with the age of twenty-seven, and was honoured later with the title “Premier Geographe du Roi”. His largest project, the “Atlas de Geographie”, was published until 1774 in Paris and Amsterdam (Covens and Mortier). He died in 1726. Pieter and David Mortier were booksellers in Paris and have published a wide range of geographical works. After Pieter’s death, his widow continued the business until their son Cornelius took over. Cornelius started a partnership with his brother-in-law Johannes Covens and established the famous publishing house “Covens and Mortier” in Amsterdam. They have re-issued Atlases of Sanson, de l’Isle, Visscher and de Wit. Subject: Map :’Comitatus Hannoniae Namurcensis et Cameracensis. 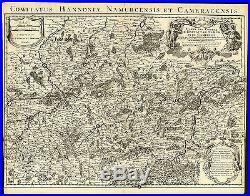 Carte des Comtez de Hainaut Namur et de Cambresis’. Map of Hainaut, Namur and Cambrai. Detailed map of southern Belgium and northeast France from Douai in the west to the area east of Namur, including Brussels, Mons and Cambrai. Forests, hills, rivers, cities, fortifications, villages, and roads are shown. Three elaborate cartouches: title, distance scale, and advertisement. Paper separation top and bottom middle fold; backed. Narow or no margins left and right. Two small tears on the left. Please study scan carefully. Size (in cm): The overall size is ca. 64 x 51 cm. The image size is ca. 64 x 48 cm. Size (in inch): The overall size is ca. 25.2 x 20.1 inch. 25.2 x 18.9 inch. Medium: Copperplate engraving on a verge type of hand-laid paper. ThePrintsCollector – Laurentius Old Master Prints Frans Laurentius, Peter Cornelissen Margo van Latum-van Dongen, Frank van Latum Located in Zeeland (Noord-Brabant) – The Netherlands. GO TO OUR STORE and explore our huge collection of fine antique maps and prints. Combined orders are possible! The item “Antique Map-BELGIUM-HAINAUT-NAMUR-CAMBRAI-FRANCE-BRUSSELS-De L’Isle-1710″ is in sale since Tuesday, June 30, 2015. This item is in the category “Antiques\Maps, Atlases & Globes\Europe Maps”. The seller is “theprintscollector” and is located in Zeeland. This item can be shipped worldwide.